A blue jay caught my eye as I glanced out the window. It landed on a bare bush limb, and the two of them swayed for a moment. The jay was the only source of vibrant color in view. The winter had since muted all the other tones of nature, leaving only a palette of browns and dull greens, all blurred by a lingering gray film. I watched the jay for a moment to see what it would do, but soon its color was joined by the black and red raiment of a woodpecker. I marveled at the size of the new arrival. It was a tall bird, perhaps the size of a small crow, though much straighter and with better posture. It landed on a higher limb of the same bush. In an effort to preserve the moment, I went to grab my camera. But when I returned, the jay had migrated to another spot. I went around to the other side of the house to see if I might find it, and when I did, I saw several other small birds. Among them were a number of small brown birds, perhaps wrens of some kind, which were picking around in the grass that rose from the gravel. They blended in with the landscape, and if not for their rapid movements, they would’ve been all but invisible to me, like the hundreds of other creatures in the scene that evaded my sight. Also among the new birds was a brilliant northern cardinal, plumed with a crimson red coat. I stepped outside and snapped a few pictures, but I didn’t look at any of them to see what I had captured, nor did I pay much mind to the framing of my shots. Frankly, I began to wish that I hadn’t gotten it in the first place. It couldn’t capture the full scope of the scene, things like the sound of a distant hawk calling out, or the shrill cawing of blackbirds, or the cool, morning air with its feeling of wetness. The blackbirds in particular made me wish to see an owl. I had seen them pestering owls on two separate occasions, primarily in a tall pine tree across the road by the creek. I remembered looking over to see what the commotion was about, when suddenly I had spotted a barred owl sitting up in one of the branches, eyeing me with no movement. If not for the blackbirds, I certainly would’ve never seen him there, hidden amongst the branches. Owls had since become a creature of fascination to me, and fortunately I had seen them on several occasions, though primarily at night when their details were too shaded to be seen. I had grown fond of their invisible screeching in the dark, warning us on one occasion of a coming downpour. One evening I had even been granted the freedom to walk within yards of one and watch it fly from various points whenever it felt I had gotten too close. The swingset had become a common landing place for them. Even so, it had been a while since my last sighting, and I knew that my chances would be slim with it being morning. Truthfully, it was the thought of another bird altogether that had propelled me to step outside in the first place. It was a bird rarer than the owls, but my chances of seeing it in the morning were much greater. It was the elusive Great Blue Heron that I had in mind. I had seen one resting in the pond behind our house on three or four occasions, always in the morning, but it had evaded my desire for close proximity with each sighting, taking flight long before I was even aware of its presence. The bird’s attendance had been harder to predict than that of the owls. It had always come when I was unprepared to find it. That said, the morning felt perfect for a sighting, and I hoped that if nothing else, I might could will the bird to appear. I chose to walk up the road and come up to the opposite side of the pond. It was a farther walk, but the pavement was quieter than the hill behind our house, the ground of which was laden with fallen leaves and branches. The bird had also been on the opposite side of the pond on each occasion, so I felt better about my chances. I strolled up the road with excitement, breathing in the cold air, and consciously walking perhaps a bit quieter than I needed to. I listened to the hawk and the blackbirds as I walked. Within moments, I came to the clearing, and I snuck up the short hill that opened up into the pond. The water was green from the tint of the morning mist, and I gazed out across it. A few frogs jumped in when they heard me coming, but the phantom bird was nowhere to be found. I looked out at the water a moment more, choosing instead to bask in its own form of beauty. It was a temporary resting place for many such trasients as the heron; humble to me, but alluring to them. It was a disgrace to overlook the wonder in its normality. I followed the trail back around to our side of the pond and walked down through the brush of the hill. The hawk made itself known again, and when I looked up, I finally saw the bird flying overhead, gazing down at things I could not begin to see. I glanced across the road at the mailbox, seeing the contents inside thanks to the door’s inability to remain shut. If nothing else, it had done me the favor of saving the walk on a few occasions, and for that I was grateful. I knew I had little interest in what was inside, but even so, I chose to jog across the road and empty it. Jogging across pavement is a fairly quiet sound, especially when done on a country road. For the most part, it does not disturb the life around it, and can easily go unheard by the complacent ear. 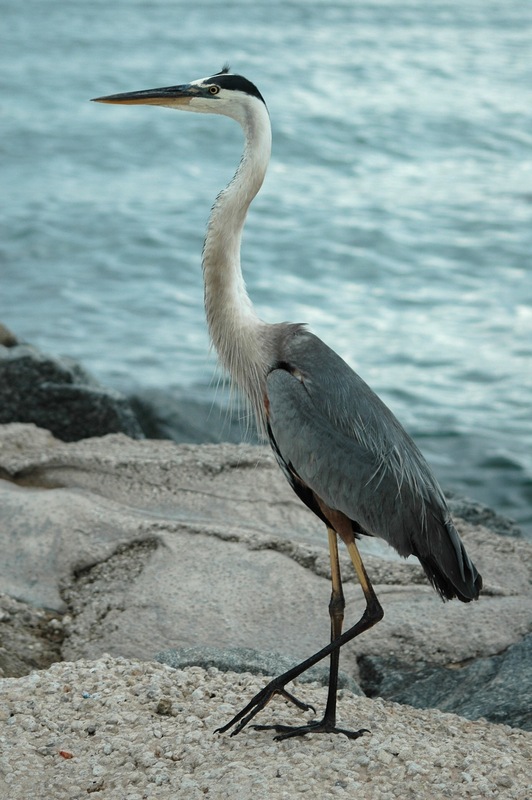 Great Blue Herons, however, do not have complacent ears. How could I have known as I stood only moments before, glancing at the mailbox from afar, that the lovely creature was standing merely yards behind it with its feet in the shallow creek below? How could I have known that my choice to jog rather than to walk would give it the signal it needed to open up its great, blue wings and fly away faster than I could ever dream of moving? I could never have known. But such is the way of the heron. And so I watched the marvelous bird disappear up the creek, flying swiftly away into the realm of the unknowable.